Life-changing events take different forms. That was the case for Kathleen Tullie, Founder and Executive Director of BOKS, who after 18 years in the corporate real estate world, decided she wanted to spend her time working on something that makes a difference. It was then that Kathleen’s desire and new-found evidence took form as she became an outspoken proponent of physical activity for children. Her idea, to bring “Fit Kidz Get Up & Go,” now BOKS, to her children’s school, was born. Since that first morning, a lot has happened. Not only are moms involved as trainers and volunteers, but so are dads, Physical Education teachers, educators and other interested parties who are all helping to run the program. Kathleen states unequivocally that the reason for the program’s success is a perfect combination of passion from parents, educators and school staff that have the motivation to make a difference in children’s lives. Kathleen and her “Mom team,” Cheri Levitz and Jen Lawrence, created a nonprofit corporation and initially approached Reebok International Ltd. for a t-shirt sponsorship. They had no idea how closely aligned Reebok’s goals were with their own. From that conversation grew a collective mission to provide opportunities and access for all children, regardless of economic status, to have healthy bodies and minds, which also helps them find success in the classroom. *Ratey, J. J., & Hagerman, E. (2008). Spark: The Revolutionary New Science of Exercise and the Brain. New York: Little, Brown. Castrechin, E. S., & London, R. A. (2011). “A Longitudinal Examination of the Link Between Youth Physical Fitness and Academic Achievement.” Journal of School Health, 81(7), 400-8. Davis, C. L., Tomporowski, P. D., McDowell, J. E., Austin, B. P., Miller, P. H., Yanasak, N. E., . . . Allison, J. D. (2011). “Exercise Improves Executive Function and Achievement and Alters Brain Activation in Overweight Children: A Randomized Controlled Trial.” Health Psychology, 30(1), 91-98. To empower school communities to improve our children mentally, physically and socially by strengthening their minds and bodies through movement. To reverse the worldwide pandemic of physical inactivity and its crippling effects. Our team believes that sport & fitness have the power to change lives. We have each experienced this in our lives and are now dedicated to passing it on to more children across the globe. There are no open positions at this time – please check back regularly for new postings. 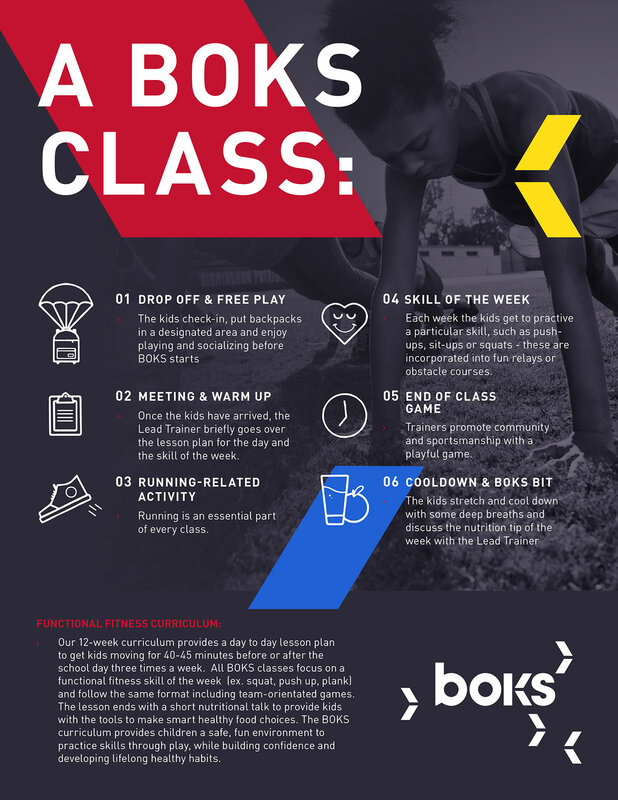 The BOKS Program Is 100% Free To Schools And Youth Organizations Due To Generous Support From Our Corporate Funding Supporters.